“The jamming in the period between October 16th and November 7th came from Russian forces on Kola,” says Birgitte Frisch, Special Advisor in the Ministry of Defense to the Barents Observer. She says the Ministry is closely following the case together with other relevant authorities. Also news agency NTB reported about the case. On November 2nd, the Barents Observer published the first news about the jamming of GPS signals in the airspace between Kirkenes and Lyngen. Last Friday, Finnish broadcaster YLE reported about similar warnings issued by aviation authorities to pilots flying over northern Finland. Birgitte Frisch says it is for the Ministry of Foreign Affairs to elaborate on the dialogue with Russian officials about the jamming. As previously reported by the Barents Observer, the Foreign Ministry brought up the question with Moscow after a similar jamming in March this year and requested Russia to halt such jamming. Last week, Deputy Director of Communication with the Foreign Ministry, Kristin Enstad, was not willing to share with the readers of Barents Observer what was said in the dialoge with Russian authorities. Lina Lindegaard, press-officer with regional airliner Widerøe, told Barents Observer about one of their flights losing GPS signals. “Our chief operating officer got a report from a captain about loss of GPS signals,” Lindegaard said. She underlined that the crew in cockpit always have alternative procedures on how to navigate if satellite signals can’t be received. 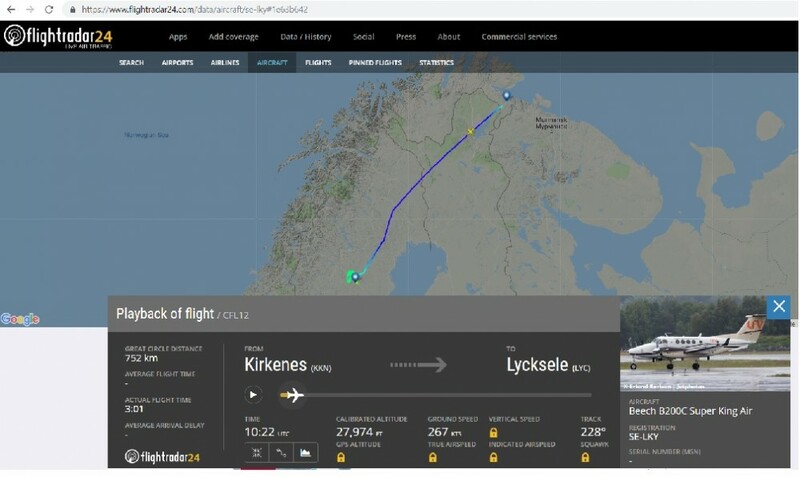 Norwegian aviation authorities’ plane SE-LKY was in Kirkenes on October 30th, but it is not confirmed whether the aircraft was measuring distrubances to satellite navigation signals in the area or not. The jamming of GPS signals happened in front of, and during, NATO’s large-scale exercise Trident Juncture. The exercise started in southern Norway on October 25th and ended on November 7th. Although not a NATO member, Finland, like Sweden, participated in the exercise and the airport in Rovaniemi played a role both for fighter jets and surveillance aircraft. Head of the Foreign Affairs Committee, ex-Prime Minister Matti Vanhanen on Friday called for an investigation into suspicions that Russia was behind the GPS jamming. Vanhanen says to YLE that GPS jamming is comparable with air space violations. «Finland has adopted a clear position on air space violations. They are publicised, investigated and we react immediately. In my view this is a similar matter from the perspective of aviation safety. It is very important to get to the bottom of these matters and react to them,» Vanhanen says. Foreign Minister Timo Soini promises he will provide a report to Parliament about the alleged Russian jamming of GPS signals in northern Finland. Russian President Vladimir Putin’s spokesman Dmitry Peskov on Tuesday said to Kommersant the Kremlin knows “nothing” about the disruption of the GPS signal. “As a rule, these allegations are unfounded,” Peskov said. The Norwegian Defense Ministry has not detailed from where on the Kola Peninsula the jamming came from. Nearest Russian military base to Rovaniemi airport is Alakurtti, 205 kilometers to the northeast. From Finland’s northernmost airport in Ivalo, the distanse to the military camps in the Pechenga valley is 167 km. From Norway’s Kirkenes airport, the distance to the Luostari military camp is 50 kilometers. When clear skies, the area in Russia’s Pechenga valley is visible in the horizon to the east when take-off from Kirkenes airport. The Pechenga valley is home to the 200th Separate Motor Rifle Brigade, a military formation under command of the Northern Fleet. A few kilometers further east is also the 61st Naval Infantry Brigade, located in Sputnik. Across the mountain is Zapadnaya Litsa, home to “Severodvinsk” – the Northern Fleet’s new 4th generation multi-purpose nuclear-powered submarine. The Kola Peninsula’s coast to the Barents Sea is also home to Russia’s largest fleet of ballistic-missile submarines. First time jamming of satellite navigation systems (GNSS) became an issue for civilian passenger planes in northern Norway was during Russia’s large-scale military exercise Zapad-2017. Interviewed by the Barents Observer after, Norway’s Defense Minister Frank Bakke-Jensen said the jamming came as “no surprise”.